Marvel has made it very clear that the new Secret War Event that is currently bringing all of the legendary Marvel story lines together will result in an all new all different Marvel Universe much in the vein of the New 52. 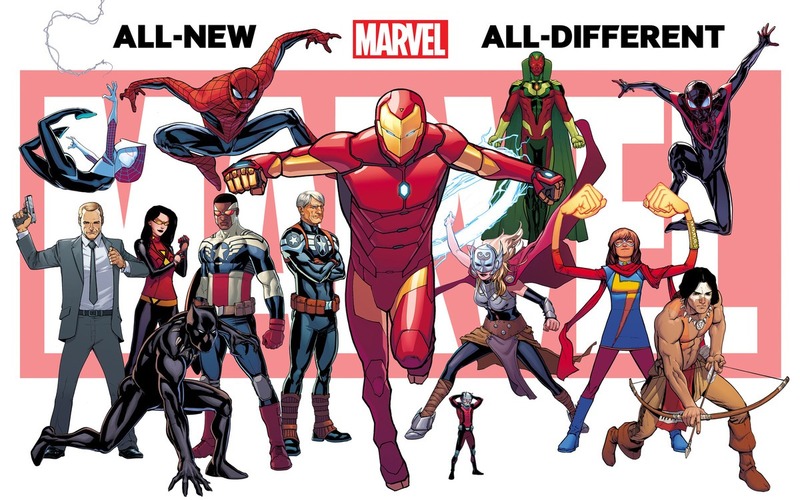 This week Marvel released an image depicting the new line up and then a few hours later released another image. In this post I will discuss the first image and the books you should be looking for. The characters appearing in this image are no big surprises following in line with the Marvel television and movie universes. We have, both Spider-Mans; Peter Parker and Miles Morales, The Newly introduced Spider-Gwen, The Newly introduced Kamala Khan as Ms.Marvel, The All New Thor, Ant-Man, Black Panther, Vision, The Newly introduced Spider-Woman, Falcon as Captain America, old man Steve Rogers, Agent Coulson, Red Wolf and what appears to be an all new Iron Man. Most of these characters are known so there are really only a few things to talk about. The All New Hulk: There is a lot of speculation around Amadeus Cho. Axel Alonso suggested Bruce Banner would no longer be the Hulk and the rumour mill is pumping up Amadeus Cho. Which has resulted in his first appearance to start to skyrocket. I talked about this character before here. 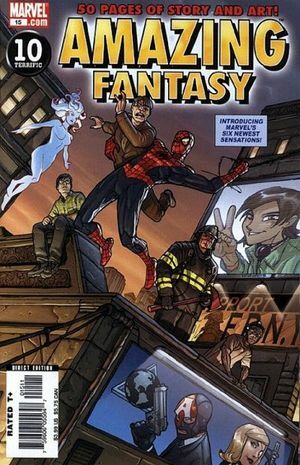 Amadeus Cho first appeared in Amazing Fantasy Volume 2 #15. A book that has currently dried up on ebay, selling for an average of $30 to $45. If the rumours turn out to be true the $45 price tag will be regarded as bargains. 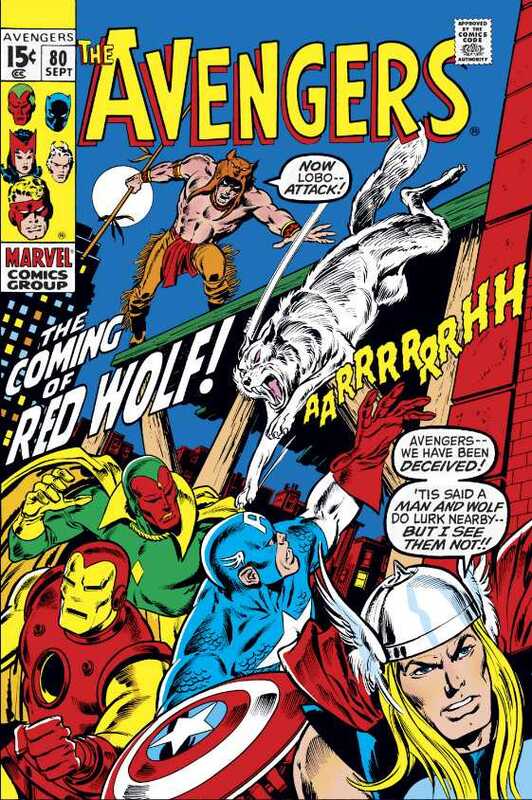 Red Wolf: Red Red Wolf first appears in Avengers #80 – this book before the Marvel U news sold for $15 to $25. In the last few days Avengers #80 has been averaging $45 to $85 in Very Fine Plus to Near Mint condition and is on the rise. This is a book to hold onto until prices start to stablize. How high will they go? Now is not the time to leave money on the table. Kamala Khan/ The New Ms. Marvel: This character has been getting a lot of heat latly. WIth the second print Captain Marvel #17 selling for upwards of $200 in raw condition! Another Kamala Khan book that has been getting noticed recently is All New Marvel Now Point One #1 (a four issue series, not to be confused with Marvel Now Point One #1 One-shot). This book is the first appearance of Kamala Khan as Ms. Marvel and has been averaging $20. This book still has a lot of moving move. SPECIAL Shout out to CBSI’s own Mark Hendrie for putting Red Wolf and Weird World (stay tuned for why thats important) on my mind. Want to be first to see our updates? Stay Tuned for Part DEUX in two days! in the vein of DC ‘s new 52…. that mean in three years Marvel will reboot back? Do you mean Captain Marvel #17 2nd print? DC hasn’t rebooted back, the new 52 universe is still going. 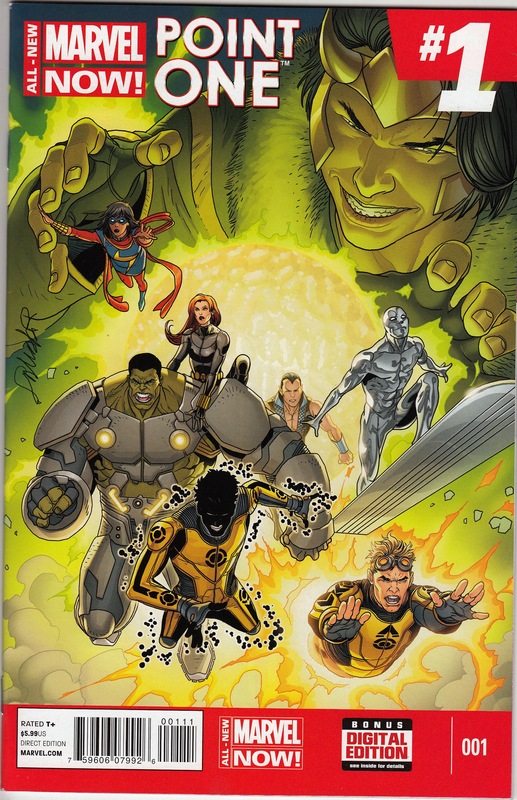 The only thing that changed was they stopped putting the words “new 52” on all the covers.